When looking for antique sleigh bells, you should focus mainly on the age of the bells themselves, but the leather straps can offer important clues. My goal in this article is to help you identify "instant antique" bell straps that appear to be old, but are not legitimate antiques. When I use the term "antique" on this website, I am specifically talking about bells made during the "horse and buggy times". 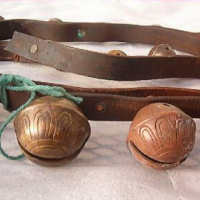 Antique North American sleigh bells date from the 1700s through the 1920s. When I use the terms "new" or "modern" or "vintage" or "reproduction", I am referring to sleigh bells made after the era of horse transportation -- from the 1930s through today. After reading this article, see also Fakes I: Old Bells that Aren't, Fakes III: Case Studies, Dating Bells, and Bell Designs for more information. You can also compare the antique and new bells we have for sale. 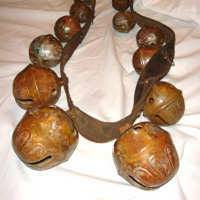 Straps with bells in perfect condition are either straps of new bells or straps with antique bells hand picked by a collector. At least a few bells on any all-original antique strap will show at least a hairline crack or two or even more significant damage or defects. Most of these straps have one big petal bell in the center with smaller bells on either side graduatiing evenly to small bells at the ends. 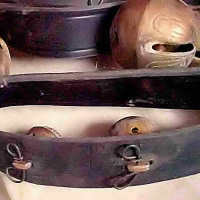 The center bell on these straps is often a size #12, #13, #15 or #18 bell and the smallest bells at the ends are usually #1 bells. Another commercially produced strap often converted into an "instant antique" is the "odd-even" petal bell strap. This style usually has a #15 petal bell in the center, odd numbered bells on one side of the strap (from a #13 bell to a #1 bell), and even numbered bells on the other (from a #14 to a #2). Other "instant antique" straps are one-of-a-kind pieces where new bells, usually with an antiqued finish, are put on leather recycled from old horse harness. 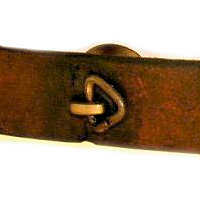 The recycled straps often have odd stitch lines, holes, and other evidence that the leather has been "repurposed". The sizes and arrangement of the bells on these straps will vary from commercially produced straps, depending on the maker's whim. Left: New strap of bells bought from a wholesaler. 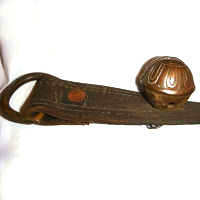 The bells were allowed to tarnish and the strap was sold as an "antique". The leather is decidedly black and shows no evidence of use or age. The bell pins are not rusty, which seems odd on a bell strap that is supposed to be "antique". Middle: Another new black strap with tarnished new bells. The buckle is solid brass -- not typical of a truly old strap. Right: New bells on recycled leather. The rusty patina on these bells is the clearest indicator that this is an "instant antique". Left: New bells with a dark, splotchy rust color on a strap made of recycled leather. This strap was touted as a genuine "antique". 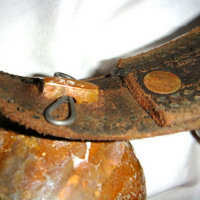 Middle: Close up of the same strap showing a new bell pin, freshly cut leather, lines of stitching along the leather that would not be seen on a real bell strap, and an untarnished copper rivet. 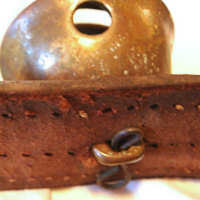 Right: Another "antique strap" with recycled leather, a fresh copper rivet, and a new bell with a deep brown patina. The dee and rivet at the end of this strap is an easy way to create an "antique" strap without the fuss of installing a buckle. Left: Three rows of stitching holes are a telltale sign that the leather is not an original bell strap. 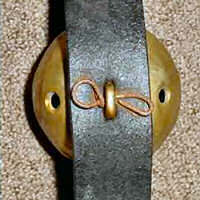 Right: The dark bells and the dry, cracked strap make this modern lined sleigh bell strap seem much older than it really is. The distant photo makes it difficult to make an informed opinion about these bells. I would either not make a bid on these bells or ask the seller for in-focus, closeup photos. 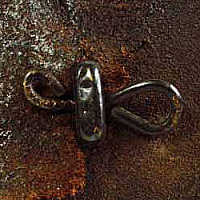 Left: Antique figure-8 bell pin made of heavy steel wire with a definite coat of rust. The pin has the nicely rounded shape formed by someone who knew what he was doing. Middle: Modern cotter key substitute for a bell pin -- not recommended for safe use on horses! Right: New, commercially made brass bell pin that has been antiqued. Ideally, each loop be about the same size and should not have such heavy tool scars. 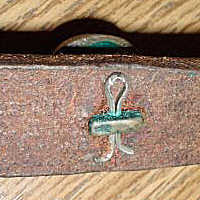 Triangular "hog rings" are a little safer than a cotter key to fasten bells onto a strap, but they are not as effective as a figure-8 bell pin. Irregularly shaped, lightweight bell pins are sometimes made from "potato wires". A potato wire is a specialized fastener used to close large sacks of potatoes or other produce.This wire is too thin and soft to give long service. 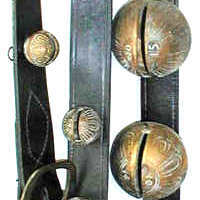 Brass "halter buckles" are often used on new bell straps. These buckles show different types of oxidation from light tarnish to dull black. Oblong metal staples are a recent invention. Small round rivets or hand stitching were typically used to fasten keeper loops in the 1800s and early 1900s. Although not especially old, this leather is dry and cracked from some years of improper care or deliberate weathering.